Continuing the journey of working together with our Crossroads Discipleship Training School staff, Pastor Marvin (one of our CDTS coworkers) invited Alexie and Alayna to join him in a ministry of his church. Every Wednesday they have Bible studies at Pinsao National High School. Alexie and Alayna were asked to present an interpretive dance during a crusade planned after school. When they went in front, everyone pressed forward to see. Even students who had been in the back talking with each other came forward and watched intently. Pinsao National High School courtyard under a canopy of feed bags. There are no mountains in the background because we are on the peak of the mountain. Besides Alexie and Alayna, the CDTS director gave a challenging Gospel message, and members of the church presented dance, song, and worship. Singers, dancers, speakers, and stage-hands with Pastor Marvin in center front. The neighborhood in which the school and Pastor Marvin's church is located is called Dreamland; perhaps because it is so high that it is often shrouded by clouds. As a way to keep us focused on our purpose of knowing God and making Him known and getting to know each other better as staff, the staff and families of the Crossroads Discipleship Training School went on a short-term outreach to the Rizal Province of the Philippines. 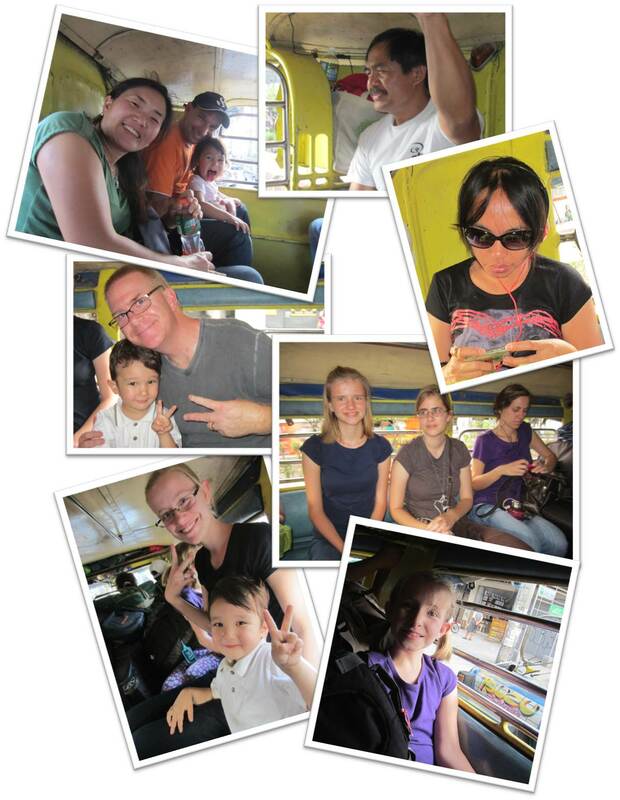 First we took a 7 hour bus trip to Manila. From there we had a 2.5 hour trip in the back of a jeepney to the small town of Jala-jala. 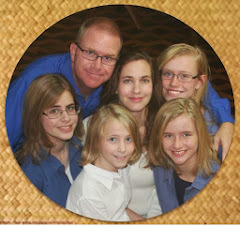 It was my first opportunity to spend much time with Tom and Soonim's children. Andrew, their 4 year old, and I quickly established the boundary of the "Boy Zone" and enjoyed thumb wrestling, counting anything, and checking our status as our jeepney "raced" the vehicles around us. The trip went well and the adults kids kept the kids adults entertained so they did not get too grumpy as kids adults often do on long trips. Sunday morning the team divided into 3 parts so that we could preach in 3 different churches. Our family stayed in Jala-jala and I preached at the church in the area our team's ministry was focused for the first few days. In the afternoon, the church held a youth gathering and our team was united once again. Merly taught about the heart of worship. Lisa then taught about leadership, using Jesus as the perfect model. After Lisa's teaching we divided the 40 or so teens into groups to further discuss the topic. It was great talking with the students in the small groups. 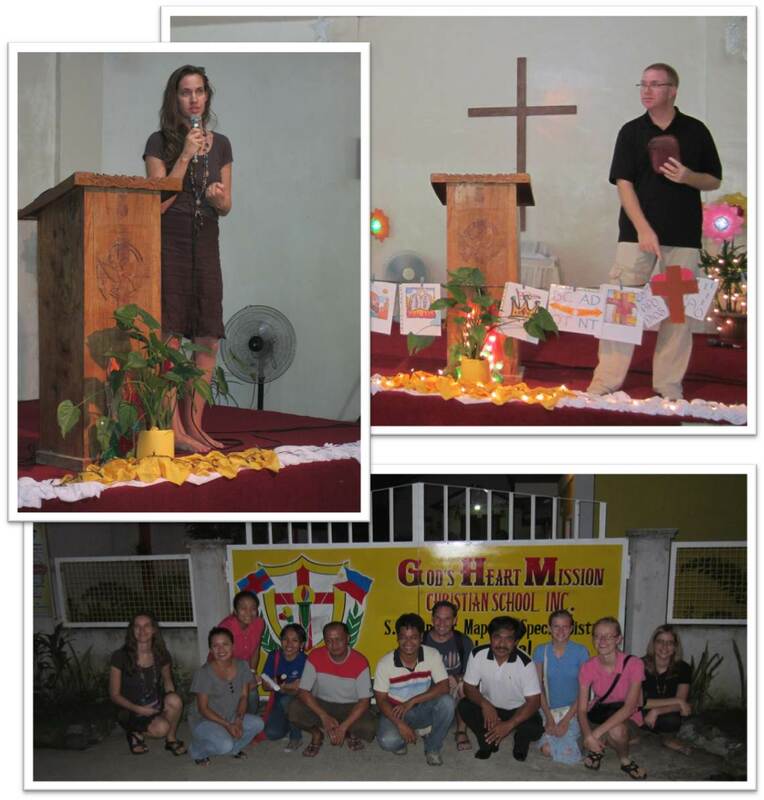 God's Heart Mission in Jala-jala. Monday we returned to the church to meet with others who would lead us on house-to-house visitation. For several hours we went throughout the area neighborhoods inviting people to come the next day to a seminar about the rocket stoves in the afternoon and a showing of the Jesus movie in the evening. 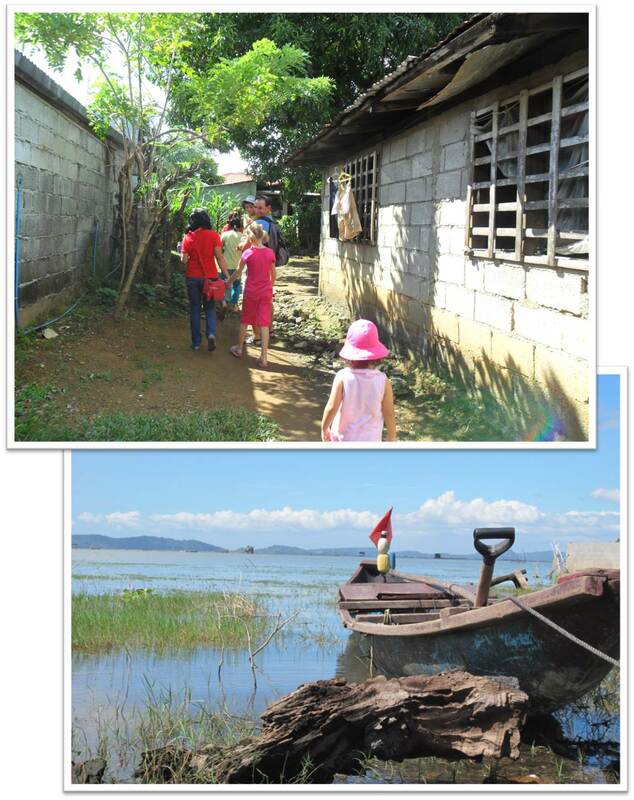 Jala-jala is a small fishing town on Laguna de Bay, one of the few large lakes in the Philippines. Talim Island is the land in the background. 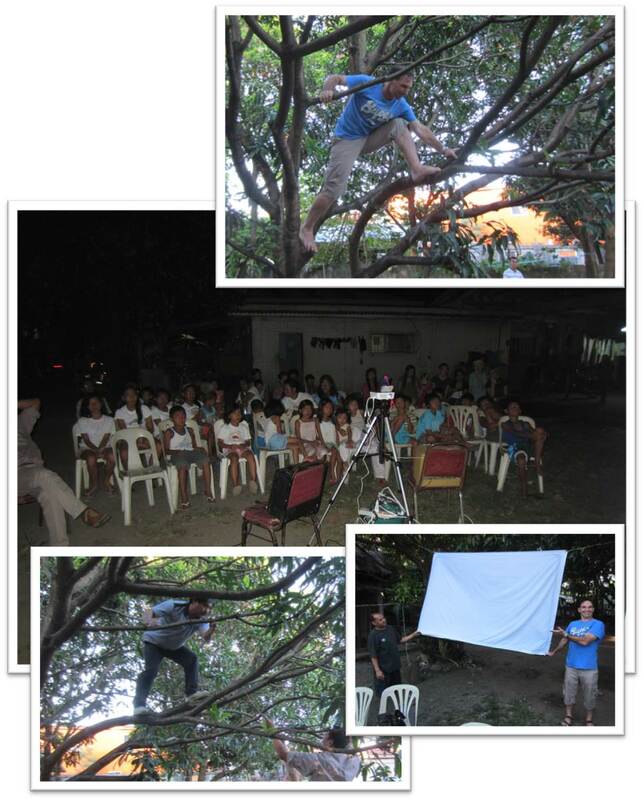 Monday night, the men from the team went to the nearby town of Tanay. There, we encouraged those attending a prayer meeting of community pastors. Tuesday afternoon we returned to the church in Jala-jala for the rocket stove and solar bottle-light seminar. The kids in the photos are students at the school the church has. They participated in the seminar also. They were really interested in the rocket stove but with so many hands eagerly trying to help, it took a while to get the fire going. One of the highlights of the trip was the film showings. Our first, was Tuesday night in Jala-jala. 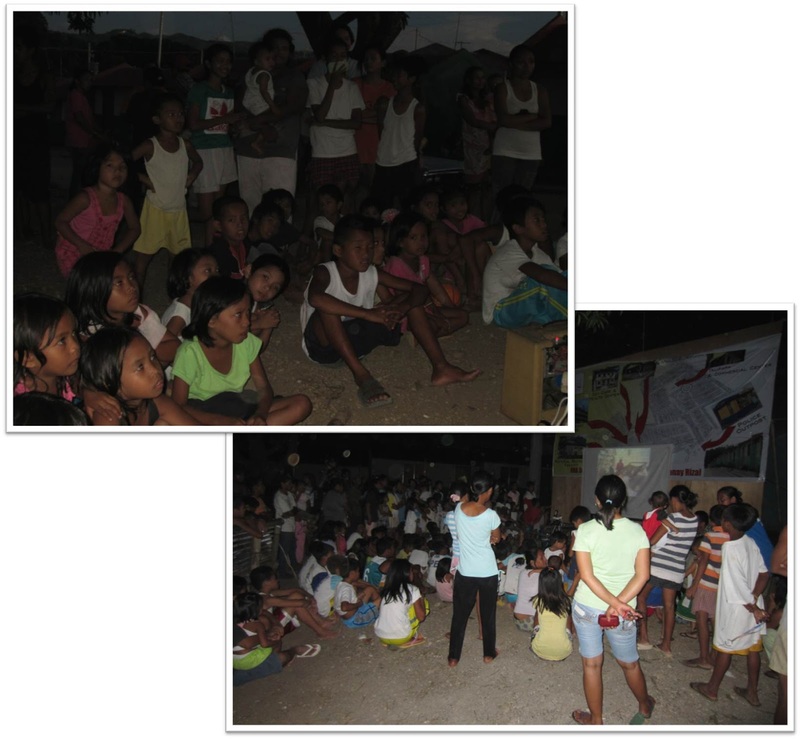 We had obtained permission from the barangay officials to show the movie at an intersection. (Although we still had to allow traffic to pass along 3 of the 4 spurs of the intersection.) The intersection was full of people watching the movie throughout the entire 2 hours - no chairs, no popcorn, no soda provided. At the end, our hostess, Margie, talked with the people. She spoke in Tagalog so I could not understand the words. But her heart and the effect it had on the people was clear as many responded to her sharing. 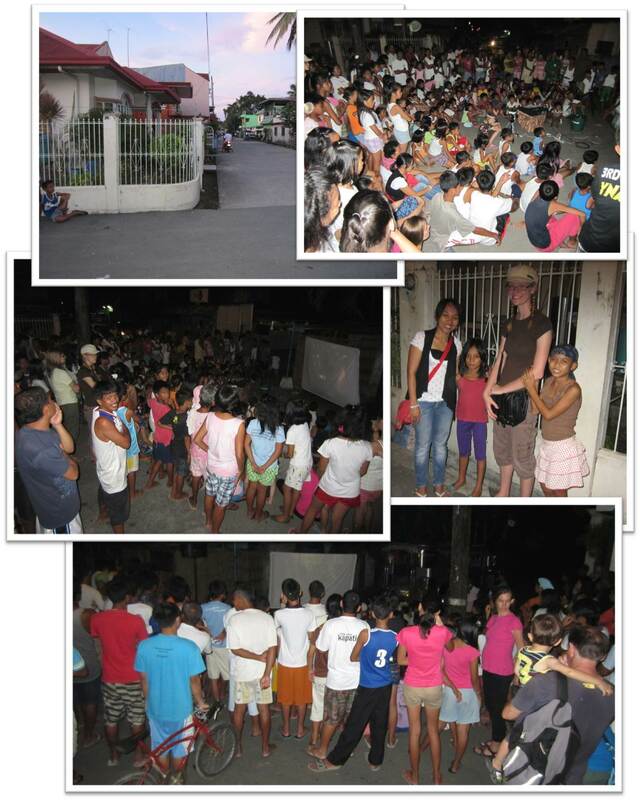 Jesus movie on the streets of Jala-jala, Rizal. The rest of the week our focus was on Tanay. 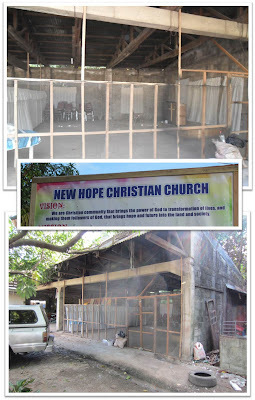 New Hope Christian Church in Tanay, Rizal. Pastor Eric from New Hope was excited to have us help him establish an outreach into the relocation area being built not far from Tanay. 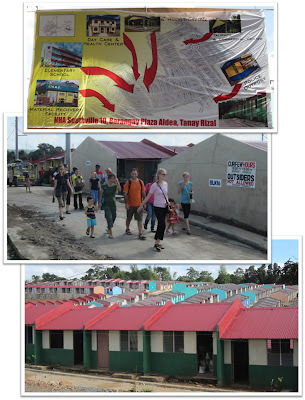 Southville is a government housing project where people displaced due to flooding and other disasters can go. The units are small and numerous in the project. Our first task was to go house-to-house talking with people and inviting them to a rocket stove seminar and a showing of the Jesus movie later in the day. While we talked with people, we had them fill out cards for follow-up later from Pastor Eric and his church. We met in a clearing under a spreading mango tree. There we taught the many who came how to make a rocket stove. This was excitedly received as most of these people moved here with few possessions, little money, and almost no livelihood prospects. This simple and reproducible technology will certainly be beneficial in that place. In the center: Pastor Eric telling the people about the love of God and inviting them to the Jesus movie, while holding the completed rocket stove up for all to see. After a busy morning at the relocation area, we had a relaxing lunch at the beautiful Daranak Falls. Back at the church, we held another rocket stove seminar for people from the neighborhood there. This time, I still did all of the talking, but I had Tom and Marvin do the cutting and fitting of the parts. As you can see in the picture below, they did a great job. Marvin showing off a hot rocket stove with everyone from the seminar. 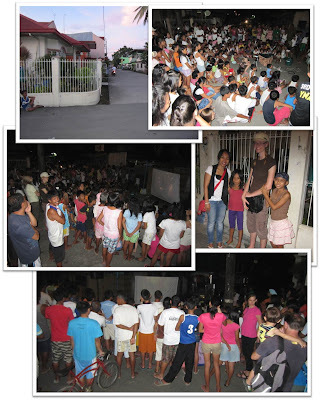 Jesus movie in Southville relocation area. Thursday morning we had a surprise visit. 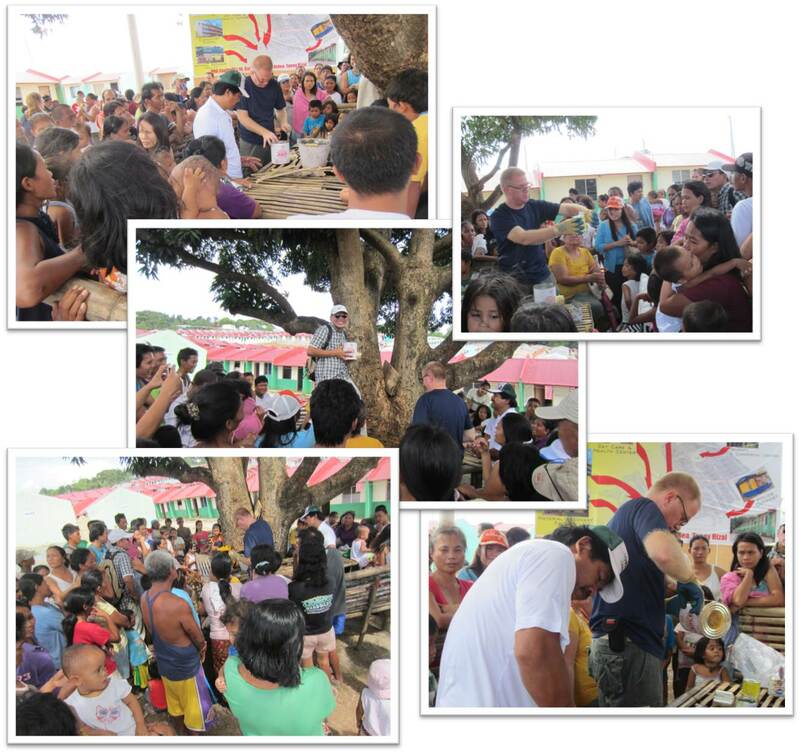 The mayor, vice-mayor, and barangay captain, hearing of our ministry in the community decided to pay us a visit. The mayor was especially interested in the solar bottle-light and rocket stove. We had a nice visit then prayed for them in their work before they left. Pilgrims and Indians don't mean much in the Philippines, but food and celebrations do. Our family and Tom were the only Americans but Thanksgiving did not go unobserved, thanks to Margie, our hostess. But instead of turkey, football, and parades, it was more "outreach style". We had grilled pork chops (not traditional, but delicious), mashed potatoes, carrots, beans, and...rice. After lunch we returned to Tanay, this time to a garment factory behind the church where the owner allows all of the employees to participate in a Bible study (with pay) once a week. Alayna and Alexie performed an interpretive dance before Marvin shared a message with the employees. 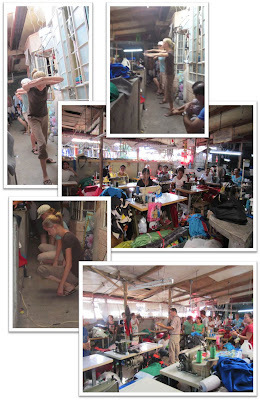 Many stayed right at their sewing machines while others crowded into the open areas on either side of the main room. Our final film showing was later that night at the church. We decided to continue with the outdoor set-up as that seemed to be more inviting to people just passing by. We had to get a little adventurous to hang up the screen, but after both Tom and Marvin had climbed the tree to make adjustments, the screen was taut and at a good height to be seen from the street. This time, we had chairs but not as many people. But we trust that God brought those He wanted to hear the Gospel that evening. Finally, the week was over and it was time to return to Baguio. It was a great week of ministering together. God really opened doors and we are confident that there will be follow-up by the local believers to the work we were able to do. We also got to know each other better and draw closer as a team, something that will be helpful as we work together for the Crossroads Discipleship Training School.